Lindeblad Piano Restoration began in 1920 out of the Brooklyn, New York home of Axel Lindeblad where he repaired and tuned pianos. His son, Ed Lindeblad, followed in his father’s footsteps in the piano business during his teenage years. During the 1950’s, Ed worked for Steinway and Sons restoring pianos. Nearly 100 years later, Lindeblad is still breathing life into fine, vintage pianos. Their long tradition of meticulous craftsmanship has spanned over four generations, and continues to be well respected among concert pianists, universities and colleges, Grammy-winning musicians, Academy Award-winning actors, late-night TV hosts, and piano owners. 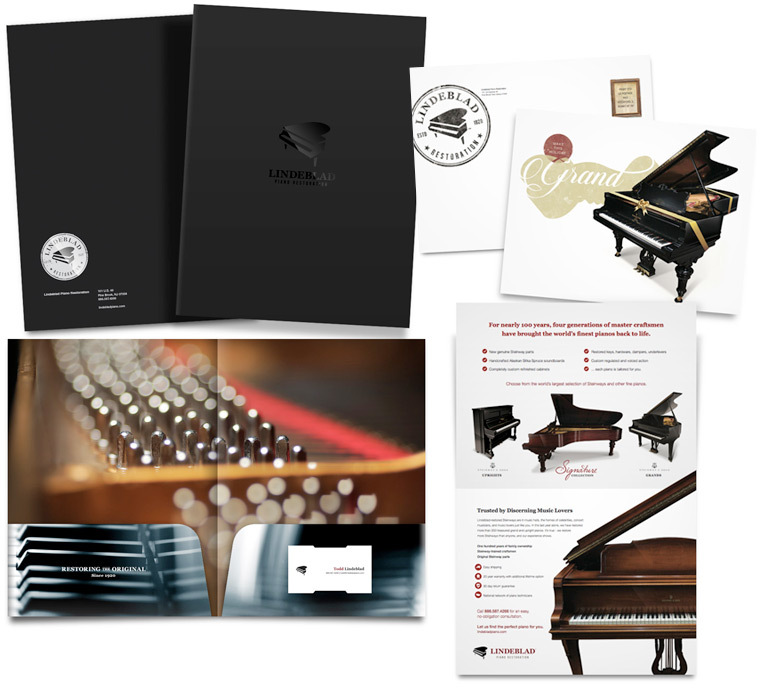 At the end of 2013, Lindeblad turned to Thinker Ventures for help restoring the look and feel of their branding to better compete with Steinway & Sons. To start, we updated their logo, redesigned their marketing material and hand-crafted a new website and database to match their quality and craftsmanship they had displayed throughout the decades. Testimonials Page – Customer satisfaction stories that showcase the meticulous craftsmanship and care Lindeblad places within each restored piano. 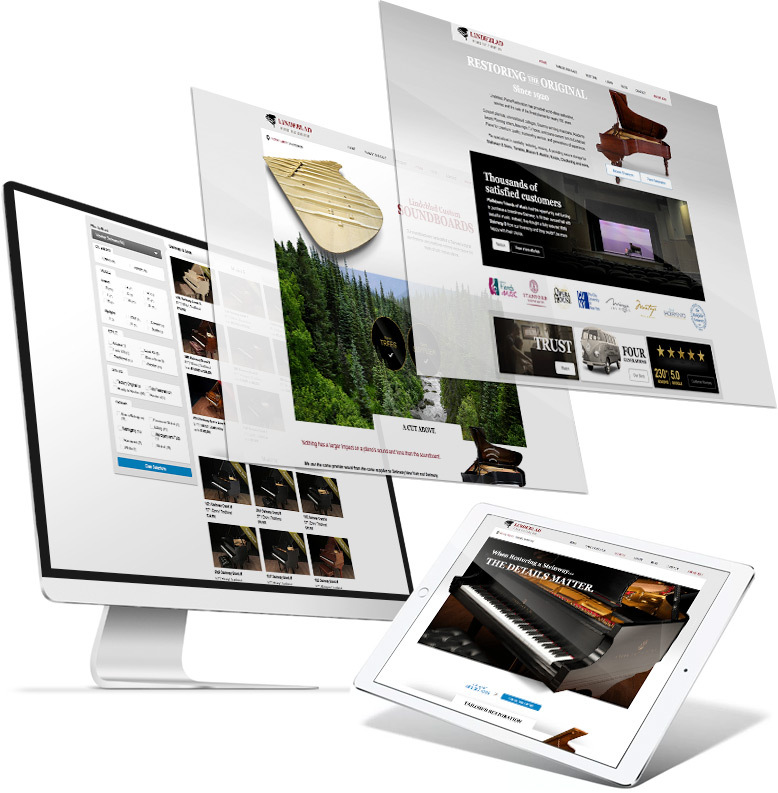 Pianos Home Page – Piano lovers can view each restored piano with high-res photos showing close-ups, it’s history and papers of legitimacy from Steinway & Sons. 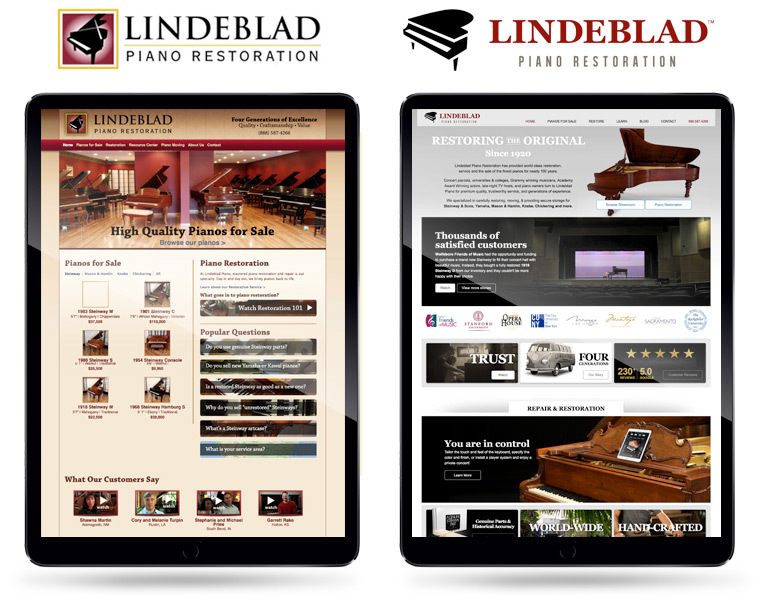 Restoration Page – Lindeblad remains transparent by showcasing how each piano is restored, building brand loyalty and trust among its customer base. We also coordinated with them on a video strategy that incorporated the new look and feel of the brand. Each video was reposted on YouTube, and all graphic design was made consistent across all mediums. Sale of two signature pianos. A 19% increase in overall page loads. Overall site bounce rate that is 4% better. Overall 14% increase YoY in restoration, piano, selling and moving requests from the site. 35 % increase in Restoration Form Requests from the site. 14% increase YoY in Piano Sales Form Requests from the site. 25% increase in social media (Facebook) likes. $11,300 ad efficiency savings by trimming underperforming display ads. Since relaunching their brand in 2016, Lindeblad has become more than just a small mom-and-pop shop that does business in New Jersey. Now that they have a better handle on what’s going in and coming out, they have become an evolving company that is breaking into new lines of business, restoring pianos in every corner of the United States and around the world. Today, we continue to work with Lindeblad on branding campaigns, advertising, as well as improving their media relations and anything else they need assistance with. For as quickly as it was growing, Lindeblad remained one of New Jersey’s best-kept business secrets. Here at Thinker Ventures, we’re happy to help get that secret out. What secret do you want to get out? How can Thinker Ventures help you with your brand? Contact us to schedule an appointment. We look forward to meeting with you.